Last year, I blogged about the first-ever National Voter Registration Day, talking about how it made “cool kids” out of my favorite people – election officials. Now, a year later it’s time for another #CelebrateNVRD and there are literally hundreds of events on tap all day. Q: What is National Voter Registration Day? A: In 2008, 6 million Americans did not vote because they did not know how to register or they missed their state’s voter registration deadline, according to the US Census. In 2013, we want to make sure no American is left out. On September 24, 2013, volunteers, celebrities, and organizations from all over the country will “hit the streets” for National Voter Registration Day. This single day of coordinated volunteer, technology and media efforts will create widespread awareness of voter registration opportunities–allowing us to reach tens of thousands of voters or more who we could not reach otherwise. • Go late in the year… People tune into elections late. More importantly, scheduling National Voter Registration Day for the spring or summer raised a risk of registering people before their primary elections, but after voter registration closed in their states, raising the possibility of widespread confusion. • …but leave time to meet all state deadlines. The first wave of deadlines occur in early October. Groups needed at least a week and a half to make sure everyone’s voter registration cards were properly submitted. • Pick a weekday, not a weekend. Weekdays provide significant opportunities to register voters at transit stops, on their way to college classes, and elsewhere, just taking part in their daily routines. • Why not Tuesday? In the United States, Tuesday is when our elections generally take place. So all else being equal, pick a Tuesday. • Be flexible. No date will work for everyone, so make sure organizations can plug in before and after. Q: Who can get involved? A: Anyone! Businesses are donating goods and space at their stores for volunteers to offer voter registration to their customers, service organizations are committing to this one day action to register their communities, high schools are making registration available to their eligible seniors, church groups and community service organizations are hitting the streets to register new communities, individuals are volunteering with events, and organizations that normally do voter registration are helping train and guide people who are unfamiliar with it. Q: What’s the process for getting involved? 1.) Sign up at www.NationalVoterRegistrationDay.org/signup. Fill out the sign on form with information about how you’d like to be involved. 2.) Create an event. You’ll be sent login information for nationalvoterregistrationday.com where you can sign-in and create a public event for other volunteers to join in your community.
.) Tell us how it went. We want to know how many people volunteered to register your community and how many people were registered because of your efforts! Q: I want to participate, but I’m not a part of a business or organization. A: That’s okay! You can either find an organization near you on our website or sign up to start an event on your own. It’s okay if it’s only you and a couple friends, that’s what we’re encouraging! Q: Is this part of a campaign or political party? A: No. We don’t support or endorse any candidate or issue. We’re strictly non-partisan. That means when you agree to participate, you agree that you won’t tell other people how to vote. We’re about democracy. We don’t care how you vote, just that you do vote! Q: I’ve never registered someone to vote before. Will you help teach me how? A: We wish we could personally train every single person – but we can’t. As we move closer to the date, organizations who have done this before will become leaders in as many states as possible. They’ll help answer questions for organizations. Some of our partners are offering webinar training sessions for people or groups who are interested. We’ll also be sending you a packet of materials that will help give you the gist of a basic voter registration drive. However, it’s ultimately each individuals responsibility to make sure they know the rules and regulations around voter registration for their state and federally. Q: Are there other people in my area doing this? A: You can find out if there are other events in your area by checking out the “find an event” portion of our website. There, you’ll be able to send an email to the organizer of each event if you’d like to join or coordinate with them. Kudos to anyone involved with National Voter Registration Day for your efforts to make elections work – you’re all cool kids in my book! 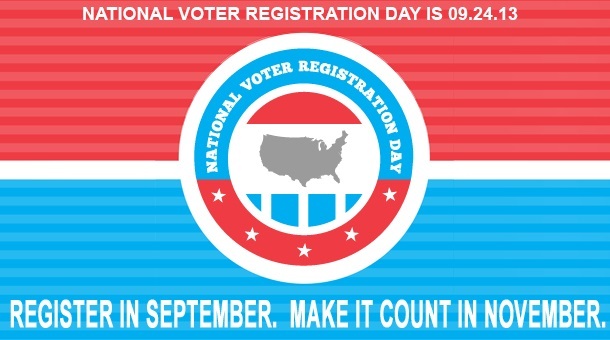 Be the first to comment on "It’s National Voter Registration Day!"